One of Tommy Orange's characters, Dene Oxendene, explains that Gertrude Stein once wrote about the place of her Oakland, California childhood, about going back there and seeing so much development that there was no there there anymore. Dene tells us that this is what happened to Native people across the Americas, ancestral land buried by "glass and concrete and wire and steel, unreturnable covered memory." And yet Urban Indians have made cities their own. "Being Indian has never been about returning to the land." The novel has 12 characters who eventually come together at the Big Oakland Powwow, people so diverse and also deeply intertwined, sometimes in ways they don't even know; but Dene seems central. He's won a project grant to document long ignored stories from Oakland Indians on video, with no director's agenda, just letting the "content control the vision;" and that's exactly how I see this novel, as the characters' stories, told forcefully. They are often frightening and confusing, but with moments of revelation and clarity and power. They feel true, not crafted to turn out the way you or I would want. The people sometimes survive, sometimes don't, and for some we're not even sure at the end. This book is a brilliantly written, unflinching look at life as it is and the constant battle to find a sense of place. 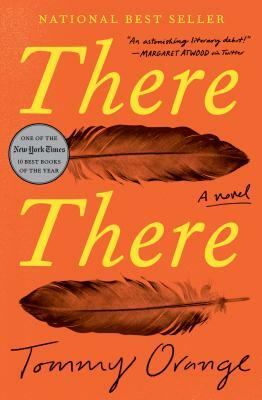 Boswell presents an evening with Tommy Orange, author of There, There. He'll be in conversation with UWM's Kimberly Blaeser on Tuesday, September 25, 7 pm. Registration required - free or upgrade to a first-edition book with ticket for just $22, including all taxes and fees. Visit orangemke.bpt.me to sign up.